Today (after a two week, work-induced hiatus) I want to talk about one of the decisions I habitually make which has allowed me to enjoy a healthier -- but still extremely fulfilling -- diet. What makes a diet fulfilling? For me, it's the ability to satisfy cravings, occasionally overindulge, experience new flavors and revel in good comfort food while still finishing a meal and feeling like I fit in my own skin. So, one choice I make which has helped create a Healthy Hungry Sam is the choice to make substitutions. On of my favorite substitutions: Bison for Beef. 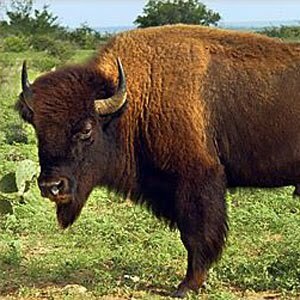 Bison is a lean, low cholesterol, lower calorie version of it's more domesticated cousin. It is, of course, another red meat (and thus to be enjoyed at a rate 20% lower than once before =) but a more virtuous variety, both healthier for me and generally for the planet (because bison tend to be grass-fed and raised using best environmental practices). I've now had bison a few times and prepped it a few different ways, but where it really shines is as a canvas for a spicy, intensely flavored burger. Using about 90% lean bison ($5.99 at Whole Foods; seen cheaper at Wegmans), I made a pair of 1/4 lb. patties, mixing in a steak spice rub I make and keep on the spice rack (salt, paprika, pepper, cayenne, rosemary, garlic). These I threw on the Foreman, grilling until medium rare. I sliced a firm, just barely ripe avocado into thick, half-inch-thick coins and whisked a few generous pinches into a scoop of low fat mayo. If my estimates seem imprecise, it's because they are; I rarely measure. 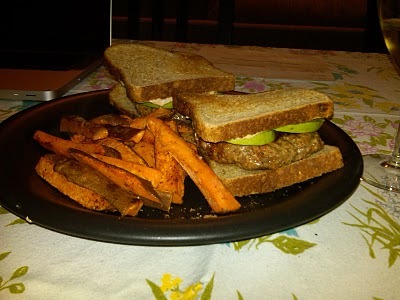 For "buns," I used some whole wheat bread, toasted. Mmmm. I know a healthful substitution has gone well when I finish and feel stuffed but comfortable. I plowed through two burgers and a helping and a half of potatoes, trying to savor the burgers of my labor but with each gulp just kind of thinking about the next bite. Pretty damn spicy -- I recommend enjoying with milk.